The Second Edition of this book is a compendium of all those facts of anatomy that are commonly asked in various examinations, viz. USMLE, PLAB, PG entrance, MD, MS, etc. 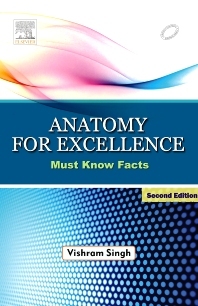 This book presents all important anatomical facts in one place so that students need not to refer large number of big textbooks. This book will also be useful for clinicians in their day-to-day clinical practice and other professional groups, viz. paramedics, nurses and radiologists.